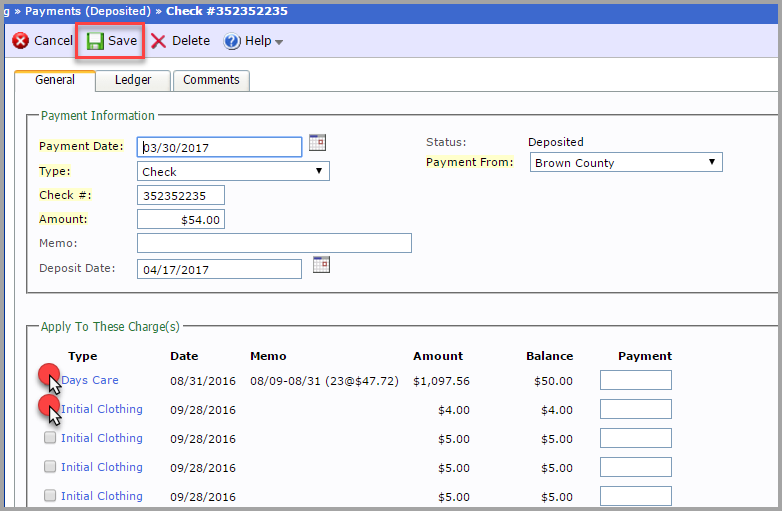 Processing Payments is part of the optional add-on tool, called “Advanced Financial Management”. If you are interested in the extendedReach Advanced Financial Management tool, please contact your Agency Administrator, or extendedReach sales. Payments are created from the case screen and applied to one or more charges, reducing the amount due. extendedReach will track the date the payment was deposited and create a deposit slip. 1. From the Financial tab in a case, click on “Payment”. 2. Complete the fields in the Payment Information section. Payment Date Click on the calendar icon to select the date of the payment. Status Since this is a new charge, the system will auto-fill “New”. 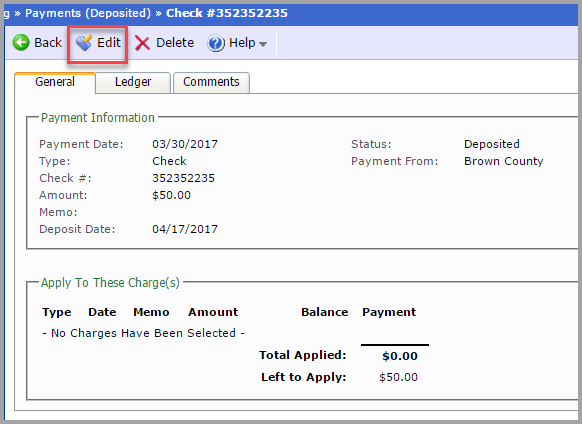 Type Select the payment type, such as check or EFT, from the drop-down menu. Payment From Select who made the payment, from the drop-down menu. Check Number Type the number from the upper right-hand corner of the check, if payment was made with a check. Amount Type in the dollar amount of the payment. Memo If there are any additional notes, they can be recorded here. Deposit Date Click on the calendar icon to select the date of the deposit. 3. Complete the fields in the Apply To These Charge(s) section. Select the item or items you want to apply the payment to, by checking the box next to the charge. 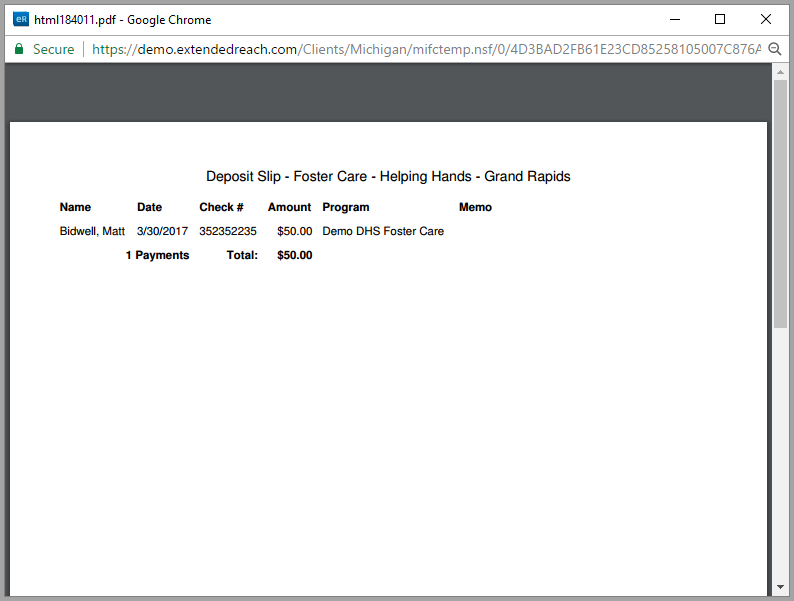 *Days Care charges that were “Generated” by extendedReach will only appear in the Charges list AFTER they have been posted to your accounting system. This prevents a “re-generation” of the charge from deleting/replacing the Days Charge after a payment has been applied. *If you have an unapplied amount (left over for the payment) – leave it as unapplied – you will receive an information message – but you can then apply this payment to the future charges. 4. If you want to enter a payment for another child click “Add Another” instead of “Save”. This is useful when applying a large check across children. This will save the Payment From / Check Number from the previous child and allow you to jump directly to the new child screen. 5. To deposit payments, go to “Organization Billing” and click on “Payments: Undeposited”. 6. Check the box next to the payments you want to deposit. 7. Click “Print Deposit Slip” (if you want to print a deposit slip). 8. Click “Mark as Deposited”. 9. Enter the Deposit Date. 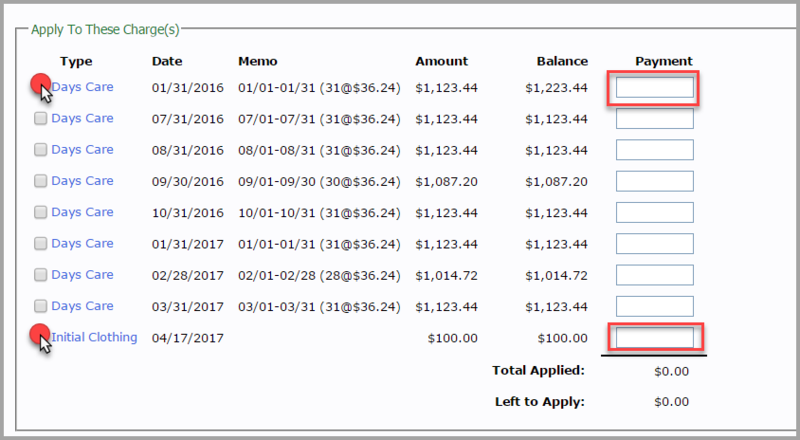 To view all deposited payments, go to Organization Billing, then “Payments: Deposited”. If you make mistake when applying a payment to a charge and save the payment, you can unapply the payment and re-allocate it to other charges. 2. Click the “Unapply” payment link. 3. Re-apply payment and Save.